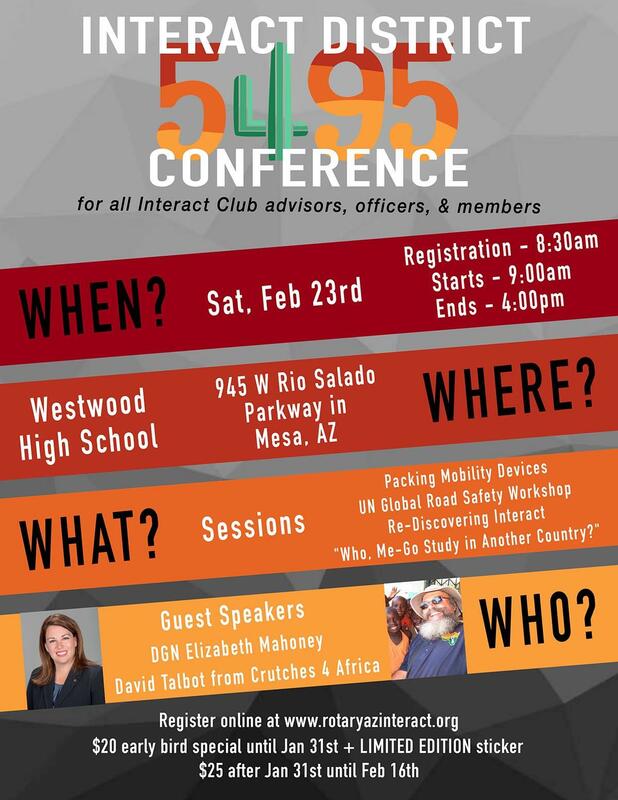 Interact District Governor Colton Cagle, and his Interact District Council, announce that their 6th Annual Interact District Conference will be held on Saturday, February 23, from 9:00 - 4:00, at Westwood High School, 945 W. Rio Salado Parkway in Mesa. At least 400 members and advisors of Interact clubs from across the state are expected to attend this action-packed, high-energy pinnacle event for youth of this Rotary year. Featured speakers at this conference will be Rotary DGN Elizabeth Mahoney and Crutches 4 Africa founder David Talbot. Included in the fast-paced program will be the introduction, for the first time, of the six Interact Ambassadors to Kenya who have been chosen to represent the district to help distribute mobility devices in that country this summer. Awards will be made to clubs that have earned the Clubs of Distinction recognition, and the top three club video entries into the district’s annual video contest will be announced and viewed. Stimulating workshops have been planned, and will be led, by the Interact District Council members. Annual anticipated features include the wrapping for shipping to Kenya of the crutches and other mobility devices the clubs have been collecting — along with a Club Advisors’ Roundtable. Rotarians are welcome to drop by Westwood High during the day to observe the Interactors in action, or they may register online via the Interact district’s website, www.rotaryazinteract.org to attend the entire 1-day conference for only $25, including lunch. The registration deadline is February 16th. The conference is, in fact, a celebration of all the amazing things Interact is doing in here in Arizona and around the world.